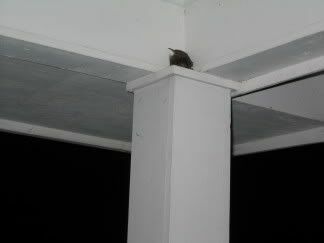 This poor little bird comes to visit everytime we have a bad storm. Sometimes he brings a friend, sometimes not. This time he was flying solo. I just wanted to share my friend with you guys! It's a Carolina Wren! I love wrens (can ya tell by my name?) Its kind of hard to see the eye stripe. The bill gave him away for me. Poor lil guy. Glad he has a nice dry place to hide out during a storm. He looks a lil shook up. This was a BAD t-storm. We had some hail with it. And I had been in and out a couple times and I think I had him scared, too. Normally he is all snuggled into the corner and comfy looking. Now that is a cute picture. When it rains bad here they crowd in my window feeder.